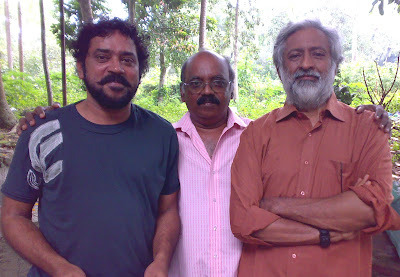 Today, along with my Director Shashi Paravoor and Art Director Krishnan Kutty, I happened to go to Chitranjali Studios to see the floor for erecting a set for the shooting of a song sequence of our Malayalam film KADAKSHAM. On the floors, a film shooting was in progress, a film about Raja Ravi Varma directed by Lenin Rajendran and Cinematography by Madhu Ambat a good old friend of mine. Acting as Raja Ravi Varma was none other than Cinematographer Santosh Sivan! From behind the camera he had come before the camera in a new role as performer and I found him really enjoying it, memorising his dialogues like a student preparing for his examinations! He is taking it as a challenge and is working hard. I am sure that he will really leave his imprint in this new field too and wish him all success! It was also rare meeting of old friends and journalist Pallissery was keen on recording the occassion for posterity, this meeting of three Cinematographers - all FTII graduates. Nice photos. Must see this one with Santosh as actor.